Dr. Musson received his Bachelor of Science from the University of Akron and his Doctorate of Medicine from the Ohio State University of Medicine. He received his Board Certification in Family Medicine after completing his residency at Akron City Hospital. 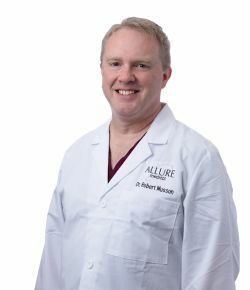 Dr. Musson has spent his entire career treating venous disease. He worked for Circulatory Centers in Ohio and Pennsylvania for 26 years before joining the Allure family. He's performed over 10,000 vein treatments over that time. He enjoys helping people feel better while improving their circulation and plans to spend the rest of his career doing just that. When he isn't helping patients improve their lives, Dr. Musson likes spending time with his family and writing books on the history of the brewing industry in the United States and has over 40 books currently published!